Water-based discharge underbase for plastisol prints. DSPP-9ZFS Discharge Agent Additive is sold separately. 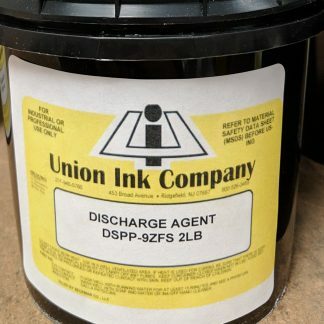 General Info: Discharge printing is a process where water-based inks are applied to certain “dischargeable” dark colored garments to produce very bright, soft prints. As the discharge inks are printed and heat cured, the original dyes in the garment are being reduced, or “discharged” from the image area. Soft-hand Discharge inks are and underbase for plastisol inks when printing on dischargeable fabrics. Regular opacity and soft-hand plastisols such as Union’s Ultrasoft (PLUE), Tru-Tone (PRPL/PRPE), and Unimatch (PTHF) inks can be printed over Soft-Hand Discharge inks producing bright soft-hand prints; also, even on dark fabrics. 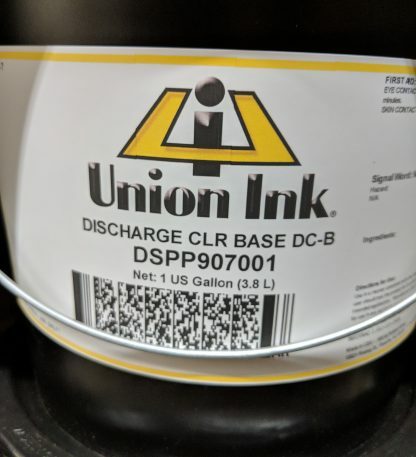 Printers who prefer not to use an underbase can create custom discargeable colors by using the DSPP-9070 Discharge Base combined with Pavonine Pigments*. After the custom color has been created, mix the DSPP-9ZFS Agent (sold separately) using the same percentages as described under Mixing Instructions, found below. The increased brightness of newly reformulated DSPP-1003 Soft-Hand White now works well as either an underbase or stand-alone white. *Pavonine Pigments are special ordered and have to ordered via phone or e-mail. Stencil: Use only water-resistant emulsion or capillary films. Mixing Instruction for DSPP-9ZFS Agent: The discharge system consists of two parts: the ink and the discharge agent. The DSPP-9ZFS Discharge Agent is furnished as a powder in a separate container. Add 6-8% DSPP-9ZFS Discharge Agent by weight to Soft-Hand Clear, Soft-Hand White or the custom color created with the DSPP-9070 Discharge Base and Pavonine Pigments. Mix until totally dissolved. Minimize the unused protion by only mixing enough of the ink system as will be used in a 6-8 hour period. Printing Instructions: Print the Soft-Hand Discharge inks first, forcing the ink will into the substrate with heavy squeegee pressure. Then without flash curing print the other plastisol inks, wet-on-wet, directly on the discharge print. 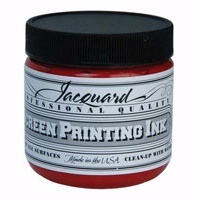 The color values of the plastisol inks printed over the Soft-Hand White or Soft-Hand Clear will appear after curing. You may mist the screen occasionally with water to maintain the ink viscosity during long printing runs. Print custom dischargeable in the same manner. Additives: All are water reduceable. Curing Instructions: Cure for a minimum of 90 seconds at 320 degrees Fahrenheit (160 degrees Celsius) to activate the discharge reaction and produce washable print. Evaporating the water too quickly will the stop the discharge reaction and result in dull colors. Wash-Up: All may be cleaned up with water. A mild detergent may be necessary if the ink was allowed to dry in the mesh. Caution: Not all garments are dyed with dischargeable dyes. The printer must test Soft-Hand Discharge inks on the garment before using in production to determine if the dyes in that garment will discharge.